Few local issues have been more divisive than the City of Austin’s 9.5-mile, $1.4 billion urban rail plan. Envisioned for a route that meanders from the Highland ACC area on the north to the East Riverside area on the southeast, the proposal is now on the Nov. 4th ballot as a $600 million municipal General Obligation bonds measure that would help fund slightly less than half of the projected investment cost. 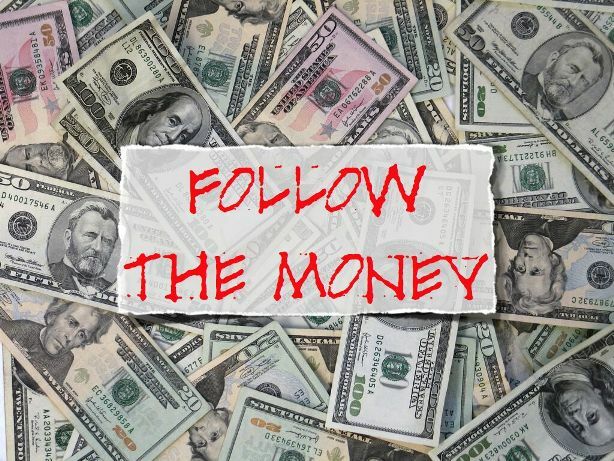 Community skepticism — and puzzlement — about this rail project is widespread, but sponsors and supporters of it have repeatedly endeavored to bolster its credibility by describing it as the product of a “scientific”, “data-driven”, or “data-based” effort, a “high-capacity transit study” pursued by the Project Connect transportation agency consortium roughly between June and December 2013. However, as this website and numerous other critical sources have exhaustively documented, that “study” was basically a fraud. 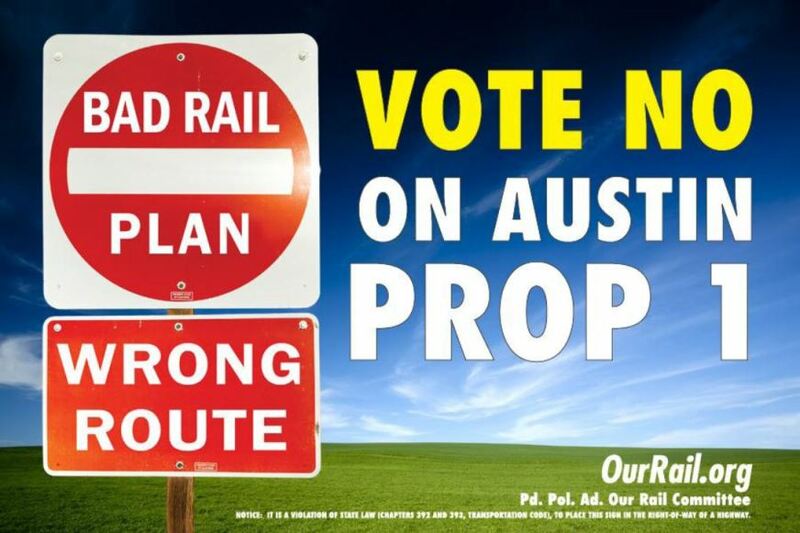 It’s useful to review and summarize the origins of this seriously flawed rail plan as election day has come upon us. In particular, it’s important to keep in mind that the Project Connect “study” represents an object lesson in how not to conduct a study for a New Start rail transit project. This review will rely primarily on previous articles published contemporaneously on this website during the “study” exercise. As our recent article Derailing the Mueller urban rail express — Preamble to Project Connect’s 2013 “High-Capacity Transit Study” recounted, for years, local streetcar and then “urban rail” planning had focused on a starter line to the Mueller redevelopment project. There, the major urban development enterprise Catellus had been promised a rail transit link to help raise density limits, attract more property investors and homebuyers, and thus boost profits. Important also were the desires of the small but growing community of Mueller residents who expected a rail connection to jobs and other destinations. 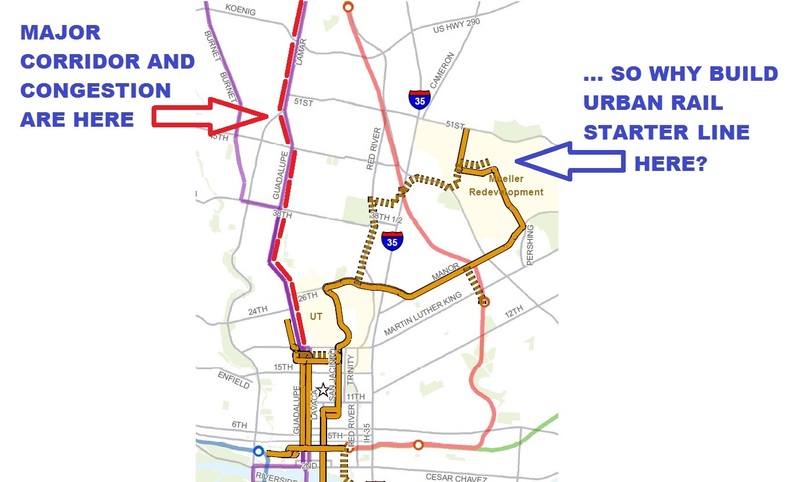 Graphic from 2012 suggested official emphasis on urban rail line to Mueller was misplaced, when real mobility need was in Guadalupe-Lamar corridor. Infographic: L. Henry. 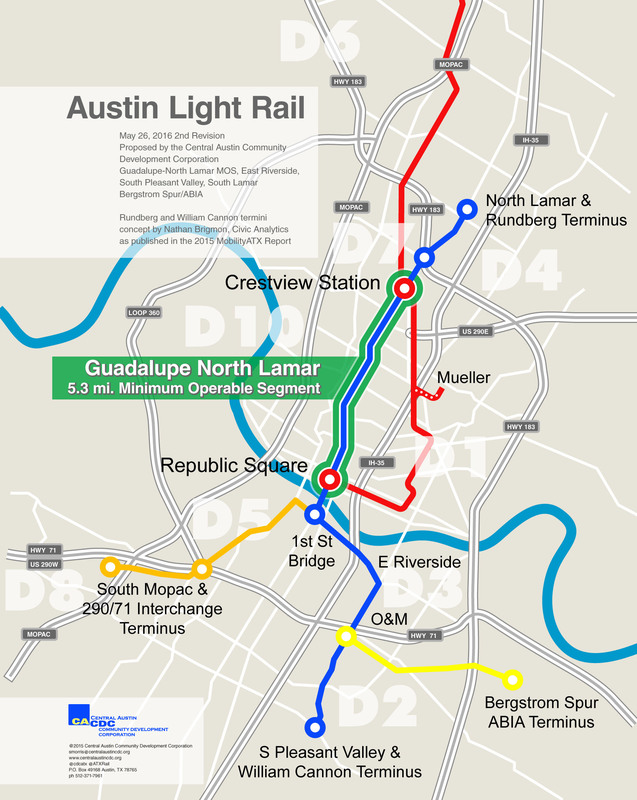 As our “Derailing…” article, cited above, further recounts, the City of Austin/Project Connect pretext for continuing to plan an easterly, East Campus urban rail starter line to Mueller began to fall apart when the competency of a 2010 “Route Alternatives Evaluation” — the nominal basis for the plan then current — was questioned. Possibly other factors may also have begun to come into play (such as business community interest in exploring other development opportunities that could affect urban rail route planning). In early 2013, Kyle Keahey was hired as Urban Rail Lead to head a new “High-Capacity Transit Study”, tasked with supposedly re-evaluating everything, racing through a process (with a presumably more competent and defensible methodology) that would result in a recommendation by the end of 2013. 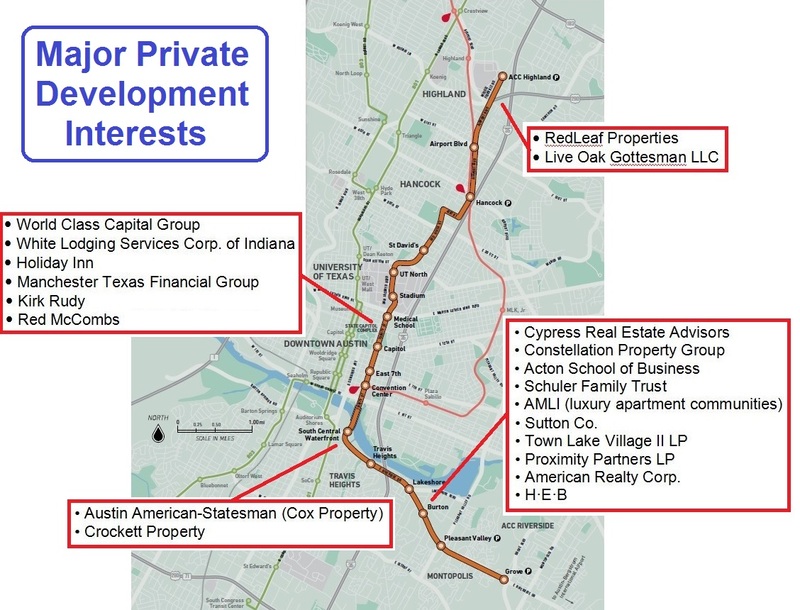 Personnel associated with Austin Rail Now, the Light Rail Now Project, and other pro-rail organizations were involved intimately in following the planning activities of the “high-capacity transit” exercise from midsummer through the early winter of 2013. A number of our articles, particularly beginning in early November, chronicled revelations and realizations about the planning process as they emerged at the time. Thus the basic flaw in ProCon’s data analysis can be boiled down to one word: GIGO (“Garbage In, Garbage Out”). In effect, this appears to have been a process that involved limiting the focus to gerrymandered data sources, and then playing games with gerrymandered data. 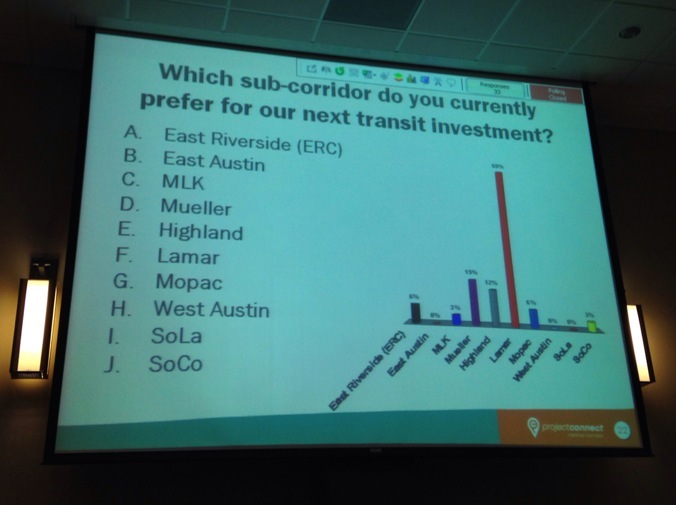 PowerPoint slide in Nov. 2013 Project Connect public presentation shows audience’s overwhelming preference for “Lamar” — a proxy for the Guadalupe-Lamar travel corridor. Photo: Workingbird Blog. Critical failings of the Project Connect “study” charade can be grouped into categories of practices. The following summaries of these practices include references to various ARN articles that may further illuminate these issues. Rather than zooming in on, and analyzing, actual travel patterns and density of travel in actual travel corridors within central Austin, the “study” instead carved out a great square of the central city, dubbed it the “Central Corridor” (although it contained multiple corridors in every direction), and then further subdivided this into a series of ten component sectors, some sprawling over considerable expanses of urban real estate. Since virtually the entire central city had been designated a “corridor”, these sectors were then dubbed “sub-corridors” — a kind of camouflage verbiage that masked the actual nature of what were in effect city neighborhoods or districts, not travel corridors. 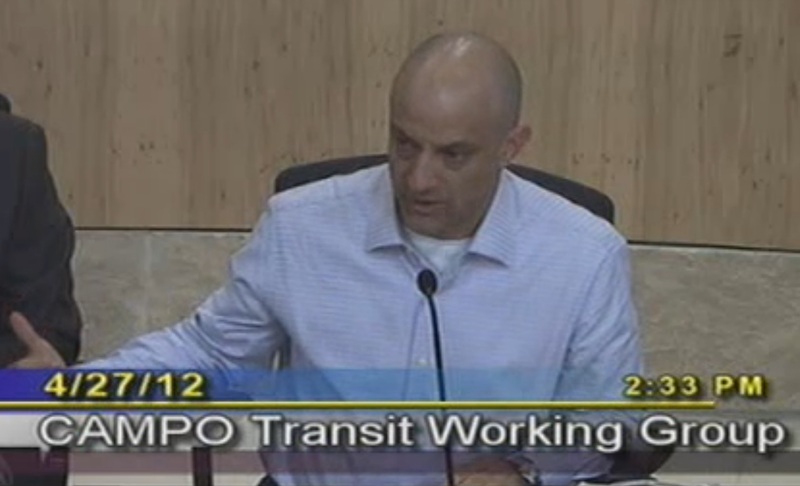 The “sub-corridor” designation also imparted a veneer of “transportation study” truthiness. … created an array of balkanized sectors that are analyzed more as autonomous geographic-demographic “islands” than as components essential to work together as a whole. As a result, actual, realistic, workable travel corridors have been obscured by all this. Project Connect’s sectors, in contrast, seem more designed to pit one part of the city against another — to function more as neighborhood enclaves to be assessed for their isolated demographics and “level of misery” (poverty, congestion, etc.) in a competitive showdown within a game of “Which sector deserves the urban rail prize?” It’s astounding that this charade is presented as a form of officially sponsored urban transportation planning. rather than performing a bona fide study of actual alternative corridors, ProCon embarked on what amounted to an inventory of highly filtered attributes of basically gerrymandered sectors, dubbed “sub-corridors”, devolving into a kind of “beauty contest” among sectors of the city, while distorting as well as ignoring the actual travel corridors that should have been the focus. It should be noted that the “Highland” sector bears very little resemblance to the actual Highland neighborhood, delineated by both the Highland Neighborhood Association (see Highland Neighborhood Association endorses Guadalupe-Lamar for urban rail) and the Highland Neighborhood Planning Area defined by the City of Austin (COA). While the actual Highland neighborhood and planning district includes North Lamar Blvd. (mostly as its western boundary) all the way from Denson Drive to U.S. 183, ProCon’s “Highland” sector studiously avoids Lamar, and never reaches U.S. 183; instead, the sector incorporates I-35 (never even touched by the real Highland), and droops down far south of the actual neighborhood to include Hancock Center and the northern edge of the UT campus — thus overlapping the long-proposed Mueller route for urban rail. In this sense, “Highland” appears to be manipulated here as a kind of “proxy” for the COA’s original plan, functioning as a precursor of a full route to Mueller. 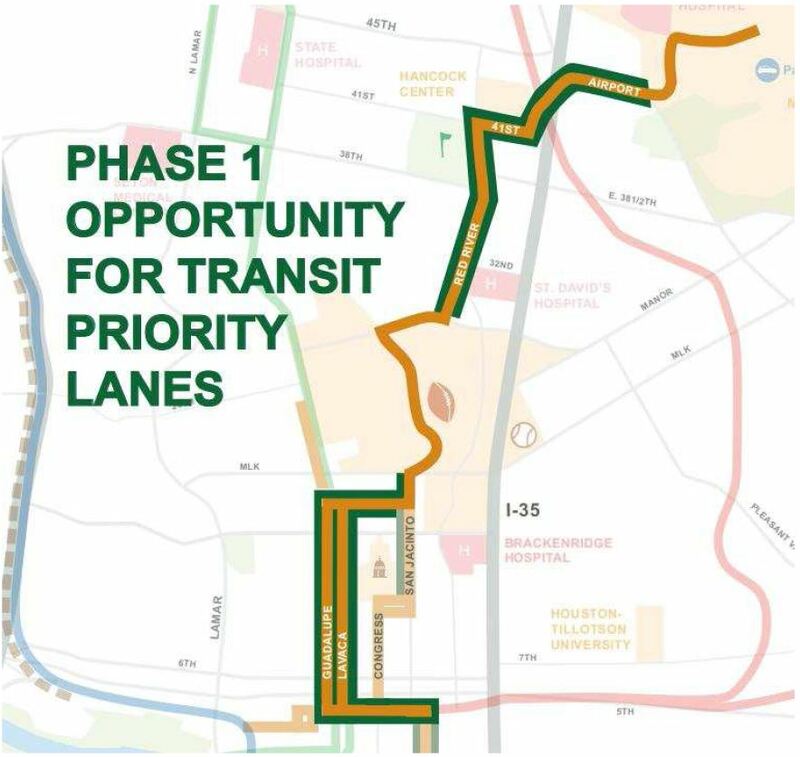 This was perhaps the single most serious fault of the Project Connect exercise — not only failing to examine actual corridor travel patterns, but essentially destroying intact corridors, such as Guadalupe-Lamar, simply because they crossed boundaries of the arbitrary sectors. As we first noted in Project Connect’s “corridor” study — without corridors! Perhaps the most serious flaw in ProCon’s urban rail study methodology — actually, catastrophic, because it fundamentally impairs the integrity of the whole process — is that the actual travel corridors are not only basically ignored as workable corridors, but also are truncated and segmented by ProCon’s arbitrary slicing up of the urban area. If you’re evaluating a travel corridor, you must evaluate the corridor as a whole — what it connects from, to, and in between; what the populations and densities along the corridor are; what activity centers it connects; and so on. 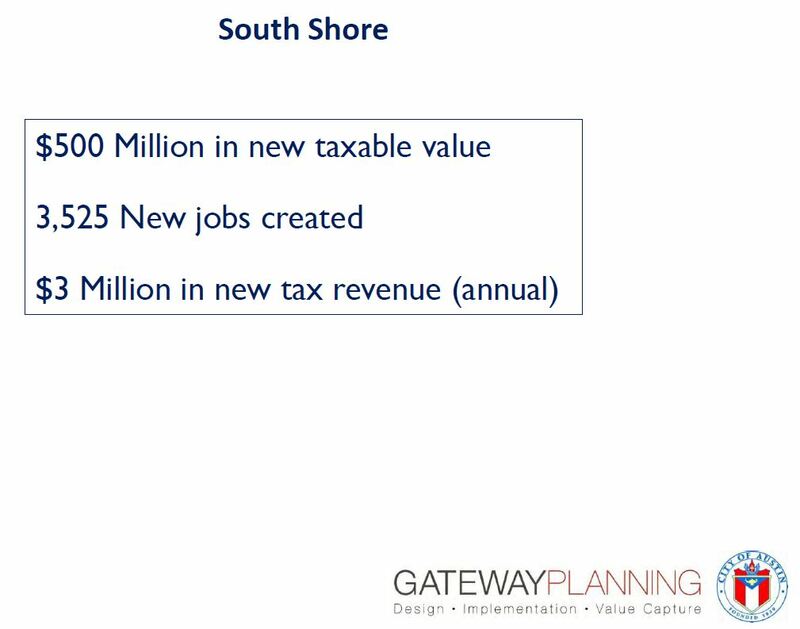 All those are important, because they’re critical to what makes a transit line in that corridor actually feasible and worth investing in. the Guadalupe-Lamar route is severed just north of the UT-West Campus area at W. 29th St. In other words, most of this potential route is cut off from its highest-density population district as well as its most productive destinations in the core of the city! What’s left is a “rump” route, from a few blocks south of U.S. 183 to W. 29th St., that seems to have little purpose beyond perhaps some kind of “shuttle” along this isolated route segment. If there were a prize for idiotic public transport planning, surely Project Connect would be very high on the candidate list. This methodology also segmented an otherwise viable corridor such as Guadalupe-Lamar into nonsensical pieces, severing the corridor from its most logical destination (West Campus and core area), and thus creating an arbitrary “rump” route (29th St. to south of U.S. 183) that goes from nowhere to nowhere. 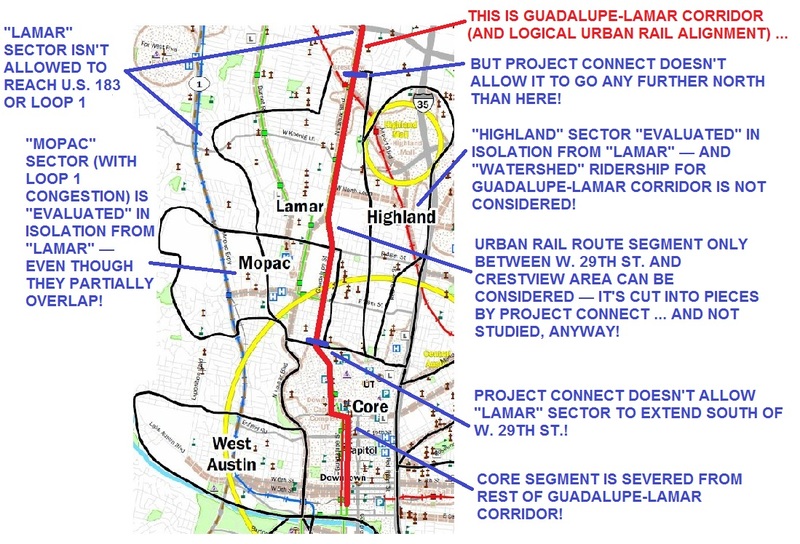 Likewise, in Project Connect Needs an Overhaul (7 December 2013), we reiterated: “Project Connect’s methodology segmented the outstanding Guadalupe-Lamar corridor into nonsensical pieces, severing it from its most logical destination (the West Campus and core area), thus creating an arbitrary ‘rump’ route that goes from nowhere to nowhere.” These warnings, of course, were ignored. While specific travel corridor trips were not examined in the “study”, Project Connect did include tabulations of total travel in each sector and estimates of trips between sectors and the Core Area. However, a particularly breathtaking aspect of the project’s Evaluation Matrix (also called the Comparison Matrix) was the exclusion of all trips except home-based work trips. In other words, non-work trips — including student trips — were omitted from consideration. As a measure of “Travel Demand” from each sector to the core, non-work trips such as UT student trips and recreational trips (e.g., to restaurants, bars, etc.) have been EXCLUDED — dismissing not only the enormous importance of non-work trips (which are heavy in the off-peak) for more cost-effective transit service, but especially the huge significance of student and recreational trips in a city with the largest university in the state (and located in its core). 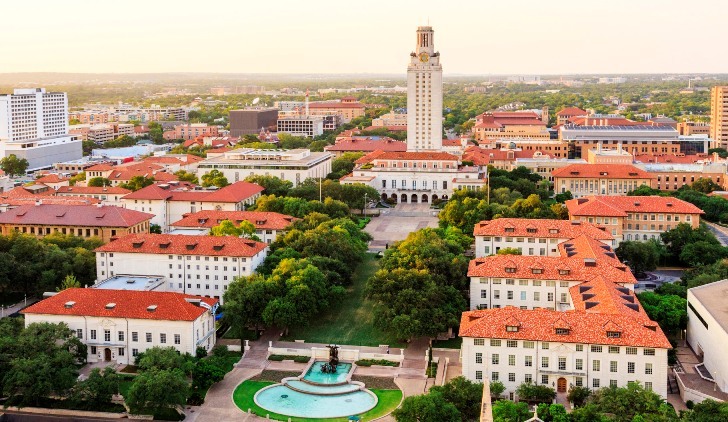 Student travel was omitted from Project Connect’s evaluation process, although their ultimately recommended route connected UT, the state’s largest university, with ACC, the city’s major community college. Photo via UTRugby.com. Extremely important non-work trips such as UT student trips and recreational trips have been EXCLUDED as a measure of “Travel Demand” from each sector to the core. How could they do this in a city whose core contains the largest university in the state? In hindsight, the omission of student travel from the Evaluation Matrix is especially ironic in light of the fact that travel between UT and ACC would ultimately be a major component of the purported ridership of the final route presented by Project Connect. Many of Project Connect’s “data projections” for 2030 were based on “wish lists” of development, population, employment, and other demographic features — leading critics to ridicule them as “fantasy”. Graphic via ARN. … Beyond a roughly five-year horizon, projections for specific neighborhoods and similar chunks of real estate basically become unreliably speculative — which seems to be what we’ve actually been dealing with … a significant dollop of real estate speculation, given a kind of veneer of “techiness” by CAMPO and their land use/travel demand model package. For decades, public transportation advocates have warned repeatedly about the “self-fulfilling prophecy” syndrome in this kind of transportation planning process. In the past, it’s been applied mainly to highway development — justifying “future growth” in just the right places where developers want to build, so as to rationalize huge investments in new freeways and other roads. And, lo and behold, these very projections somehow materialize after the transportation facilities are built, thus “proving” the “validity” of the projections! 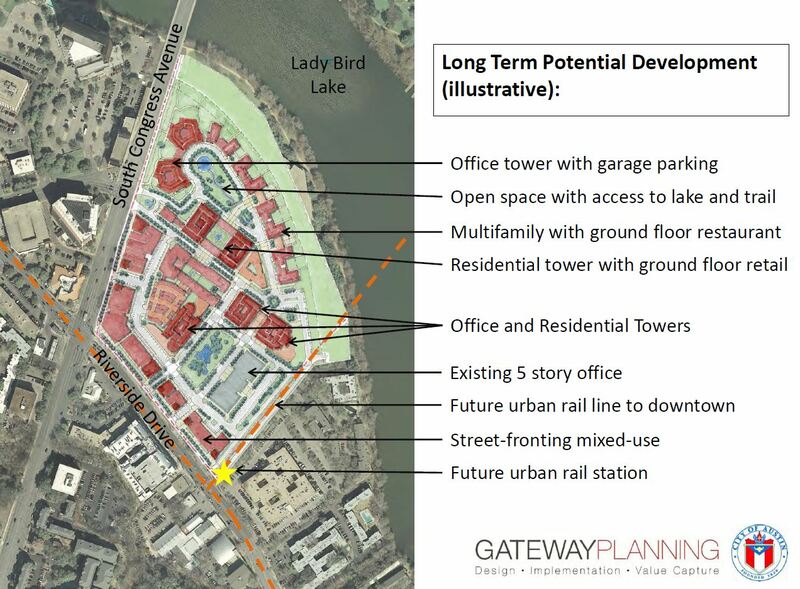 Today, in Austin, this process may be at work justifying speculative land development in certain areas of the central city (i.e., the central study area — “Central Corridor”), this time with the added drawback of ignoring or dismissing opportunities for redevelopment of areas in the heart of the core city, particularly centered along the Guadalupe-Lamar corridor. As we summarized the pattern in What’s with Project Connect’s “2.9 million daily ridership” projection? Project Connect’s “Physical Constraints” metric appears to be based on totally subjective value assessments, and no information has been given as to how these value judgements have been developed. Where’s the factual basis for this? The study has assigned an extremely high “Constrained Right-of-Way” penalty to the “Lamar” sector, but not to the “Highland”, “Mueller”, “ERC” sectors — apparently implying that Project Connect considers there to be no “Constrained Right-of-Way” problems for “Highland”, “Mueller”, and “ERC”. This also is implausible, and this penalty seems to be arbitrarily applied to sectors (“sub-corridors”) that the Project Connect team dislikes (e.g., “Lamar”), but withheld from sectors they seem to prefer (e.g., “ERC”, “Highland”, “Mueller”). According to the documentation, the TOI metric is envisioned to assess transit ridership demand at the level of a small analysis zone …. Project Connect planners, however, have applied the model to considerably larger sectors covering several square miles with hundreds and even thousands of acres. … the results are extremely implausible — e.g., for the “ERC” (East Riverside) sector, Project Connect calculates high total daily transit ridership of 2.9 million, about equal to the total citywide daily ridership of Chicago and Philadelphia combined. (Their “low estimate” for that single sector is higher than the total citywide ridership of entire cities like Denver and Seattle.) This strongly tends to corroborate other evidence that Project Connect’s projections have been seriously exaggerated and are utterly implausible. Rather than developing conservative, reliable, and plausible forecasts, Project Connect has produced exaggerated, highly questionable projections, heavily skewed toward certain geographical areas. When these same projections are plugged into Project Connect’s own Transit Orientation Index (TOI), the results are ridiculously unbelievable. For the single “ERC” sector, the low-end prediction of daily transit ridership is higher than the total system daily ridership of entire cities like Denver and Seattle. On the high end, it’s about equal to the total system daily ridership of Chicago and Philadelphia combined. These implausible outputs from the TOI were jaw-dropping. When the projections of Year-2030 population, employment, and other data items that were mainstays of their Evaluation Matrix were fed into the model, even the low-end results were absurd. For the “ERC” (East Riverside) sector, for example, as we pointed out in our What’s with Project Connect’s “2.9 million daily ridership” projection? analysis, “… the low-end figure — daily ridership of 492,682 (493K) — is equally preposterous, exceeding the total system daily ridership of entire large cities.” These cities included Portland, Seattle, Denver, and Atlanta. …the TOI model results for 2030 are similarly off the scale. Whereas current 2013 ridership is about 5K (5100/day), the “low” TOI prediction for 2030 is about 127K — an increase of 2,440%. The “high” prediction (no need for upper-bound substitution in this case) is 279K — a predicted increase of 5,480%. 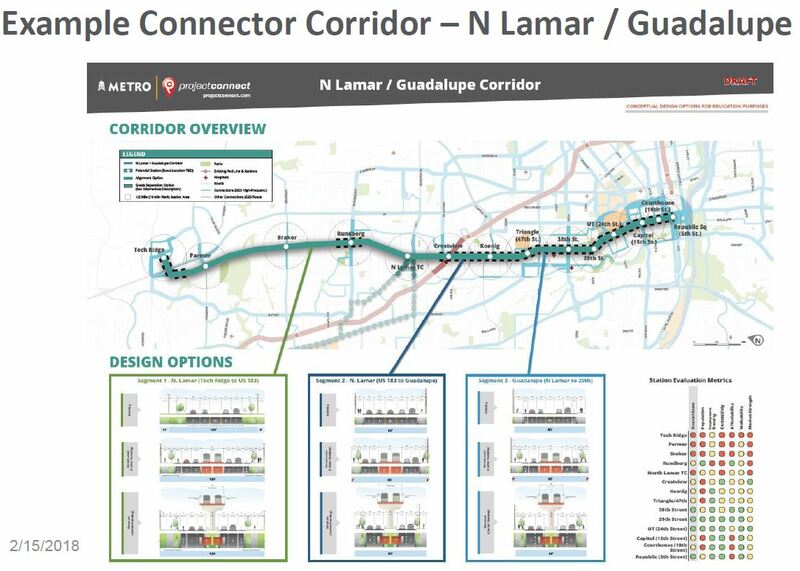 The impact of all these seemingly disconnected errors, missteps, omissions, and methodological shenanigans on a single portion of the “study” area is illustrated by the infographic at the top of this post, which focuses on several of the sectors surrounding the Guadalupe-Lamar travel corridor. (The so-called “Lamar” sector was widely misinterpreted as this corridor itself, but it was actually just a wide swath of urban real estate, stretching as far west as Shoal Creek Blvd., and embracing Burnet Road to the west as well as a segment of Guadalupe-Lamar in its eastern half — and neither of these two major travel corridors was examined.) As this graphic makes clear, the ground rules and methodology of Project Connect’s “study” very effectively prevented meaningful evaluation of this key, heavily traveled, central corridor. From this grab-bag of colossal problems, your first assessment might be that Project Connect’s team was the rail planning equivalent of The Gang That Couldn’t Shoot Straight. Unfortunately, it’s worse. What actually emerges out of all this, from the vantage point of a year of hindsight, is a much more troubling image than mere ineptitude — by connecting the dots, the outline of a deliberate effort to deceive and to manipulate the “study” becomes unmistakable. Project Connect Urban Rail Lead Kyle Keahey presenting “recommendation” of Highland-Riverside urban rail route, Nov. 2013. Photo: YouTube screengrab. Contradictory as it might seem, it’s entirely plausible that otherwise technically competent members of the Project Connect team, drawn into the “trees” of the exercise, were unaware of the implications of the larger “forest”. 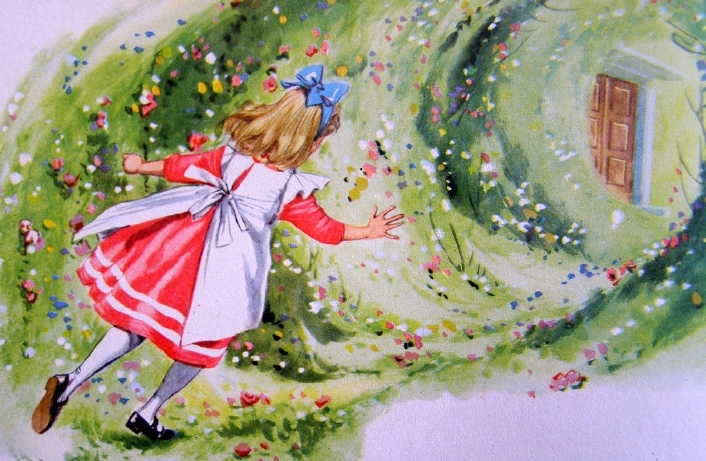 Also the mind, with its ability to rationalize, justify, and alibi, can be a very mysterious apparatus. So there’s motivation. There’s an amazing assortment of jaw-dropping methodological botch-ups. And it all fits together to promote the desires of the sponsors of the exercise. Urban rail concept started as a plan for a streetcar “circulator” system, shown in this early map from 2006. 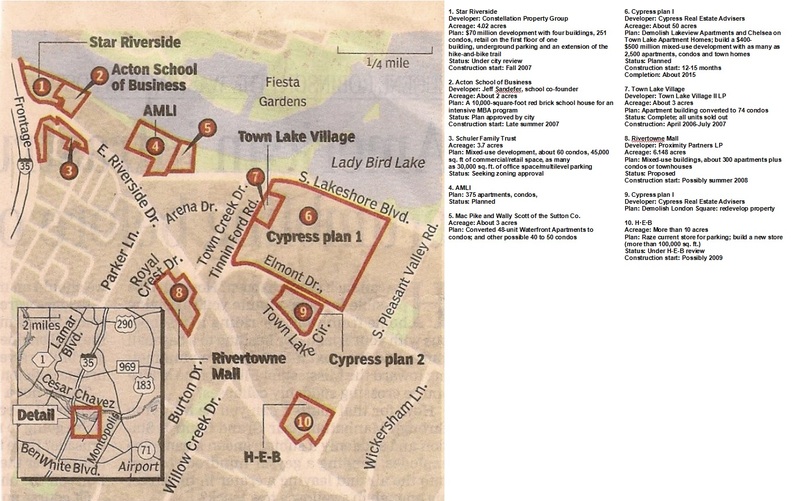 Map adapted from Austin Chronicle. To understand the roots of the Highland-Riverside urban rail plan on the ballot today, you need to understand how an official “express train” planning process, aiming to lock in an urban rail line to the Mueller redevelopment site, got derailed and sidetracked by community intervention. Here’s a very abbreviated version of the story. 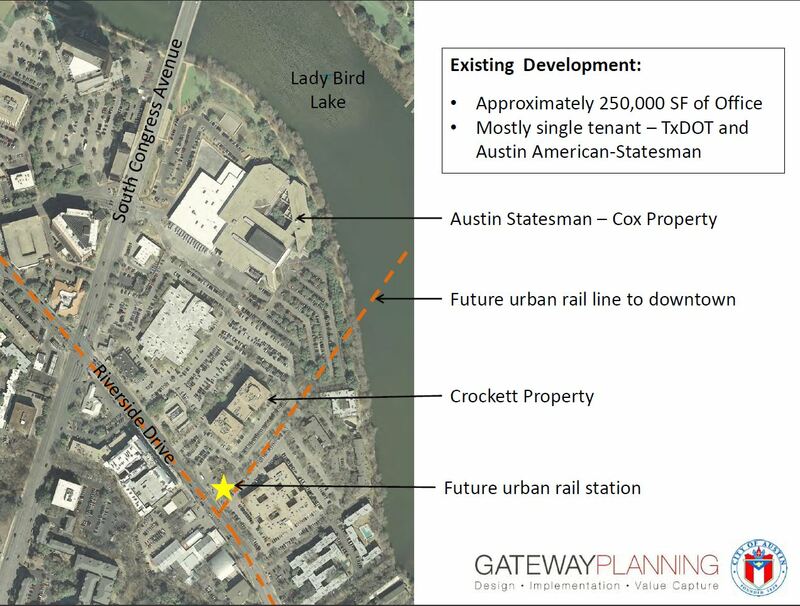 Austin’s current “urban rail” planning arose ca. 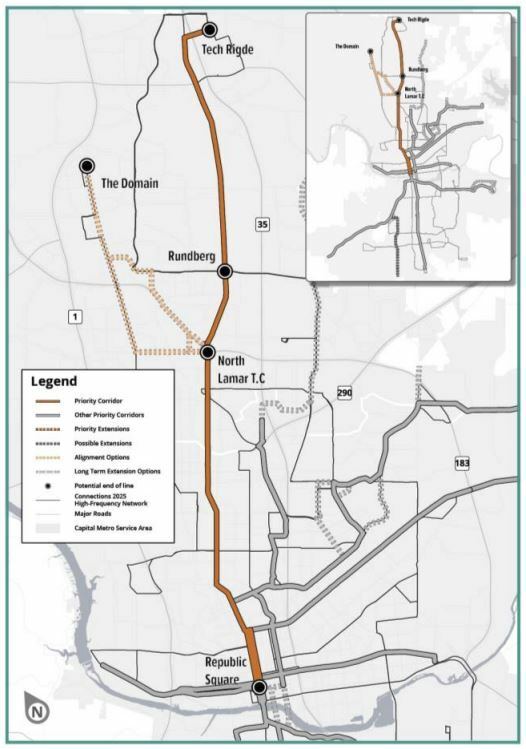 2005-2006 following the November 2004 voter approval of Capital Metro’s “urban commuter rail” project, in a package (including “rapid bus” service) called All Systems Go proposing the operation of DMU (diesel multiple-unit) railcars between downtown and the suburb of Leander. 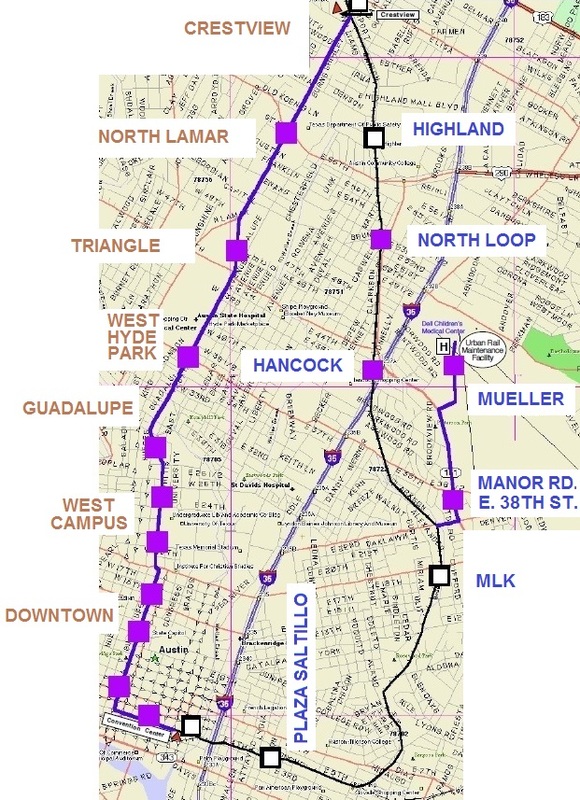 The previous light rail (i.e., urban rail) plan for a line on Guadalupe, North Lamar, and the railway alignment northwest as far as McNeil had been shelved in mid-2003 in favor of the cheaper, but very bare-bones, DMU plan. 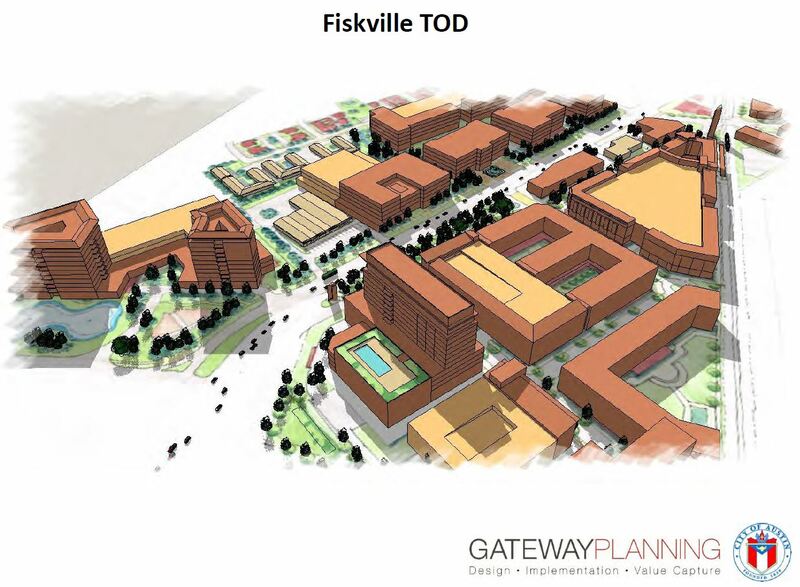 But, critics asked, what about the dense West Campus neighborhood and the busy commercial district on The Drag? What about the original plan for light rail along Guadalupe and Lamar? 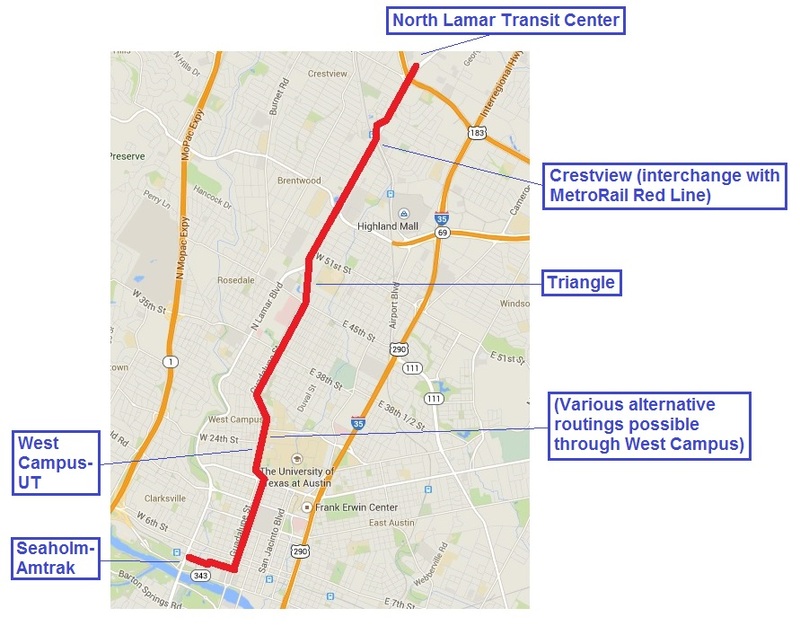 The “rapid bus” service included in the All Systems Go package, intended as a precursor to rail in the Guadalupe-Lamar corridor, was then viewed only as a temporary “fix”, and it seemed clear that rail needed to be planned for that corridor as well. In 2008, as a line on East Riverside to ABIA, with a bridge over the river into the CBD, was proposed, planners became convinced that capacity and speed required fullsize light rail transit (LRT) rolling stock. However, apparently to distinguish the emerging plan from the original, centrally routed Guadalupe-Lamar line, and to retain some of the supposed lower-cost ambience of streetcar technology, the expanded system was dubbed “urban rail”, supposedly a hybrid between a streetcar and a rapid LRT system. 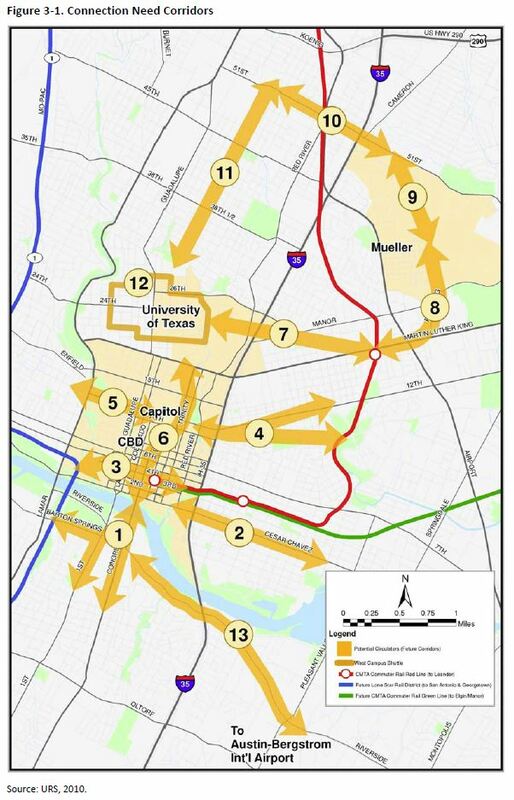 By 2010, the Central Austin Transit Study (CATS), prepared by a consortium headed by URS Corporation, recommended a system that stretched from the Mueller site, down Manor Rd. and Dean Keeton to San Jacinto, then south through the East Campus, across the river, and out East Riverside to ABIA. Alternative alignments were suggested, and spurs to Seaholm and the Palmer Auditorium area were also proposed as later extensions. 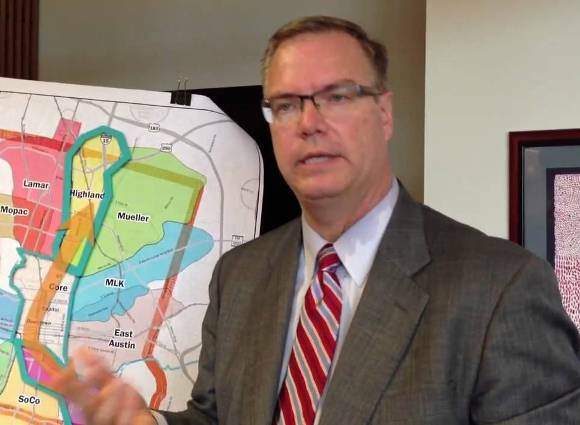 As the project made its way through the National Environmental Protection Act (NEPA) process, and afterward, the route structure gradually solidified; for a connection to Mueller, a preference was emerging to move the alignment from Manor Rd. to a route via Red River and Airport Blvd. But even the gesture of a spur connection to the West Campus began to vanish, prompting Lyndon Henry and the Light Rail Now Project to call attention to the need for urban rail in the “Missing Link” — the gap between MetroRail’s station at Crestview and North Lamar, and its terminus downtown. Because of that gap, not only were passengers inconvenienced by having to transfer to buses to access their destinations along the Guadalupe-Lamar corridor, but also Capital Metro was running costly bus shuttles to connect MetroRail stations on the east side to the UT campus and the Capitol Complex. See: Give priority to “Missing Link”. 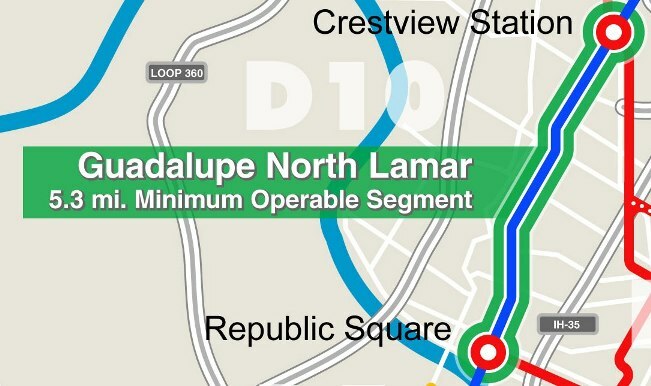 “Missing Link” urban rail (green), in Guadalupe-Lamar corridor, would provide the crucial connections to core neighborhoods, UT West Campus, and Capitol Complex missed by MetroRail (dashed red line). Infographic Map by Light Rail Now. But why had the West Campus, and Guadalupe-Lamar, disappeared from the official urban rail plan? As Henry, Dave Dobbs, Andrew Clements, Roger Baker, and others persistently raised this issue, mainly at meetings of the Transit Working Group (a blue-ribbon committee of civil leaders nominally attached to CAMPO, the Capital Area Metropolitan Planning Organization), planners and officials under the aegis of the Project Connect public agency consortium pointed to a Route Alternatives Evaluation Process included in the 2010 CATS project that had supposedly ruled out a “University of Texas (UT) to North Central Austin (Hyde Park)” route, instead giving top scores to routes serving Mueller, East Riverside, and Seaholm — basically, what City policy actually wanted. Scrutinizing the “Route Alternatives Evaluation”, Henry identified serious methodological drawbacks and summarized these in a commentary, City’s Urban Rail “alternatives analysis” omitted crucial Lamar-Guadalupe corridor! presented to the TWG on 27 April 2012. These problems are also discussed in our article City’s 2010 urban rail study actually examined corridors! But botched the analysis… (26 November 2013). 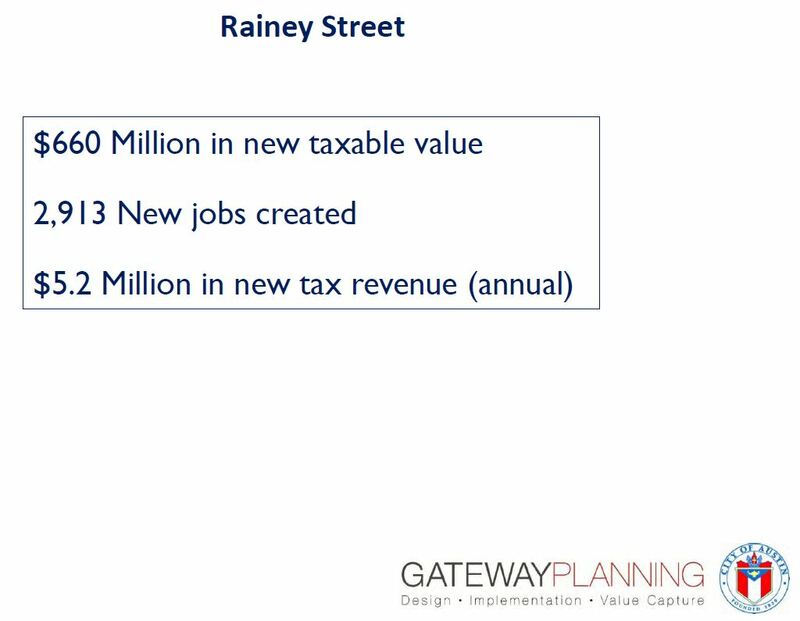 Basically, the 2010 “evaluation” totally ignored the Guadalupe-Lamar corridor, and “evaluated” an array of alternatives with subjective ratings of 1, 2, or 3. Thus, voila! The preferred official routes, including the route to Mueller, won the “competition”! 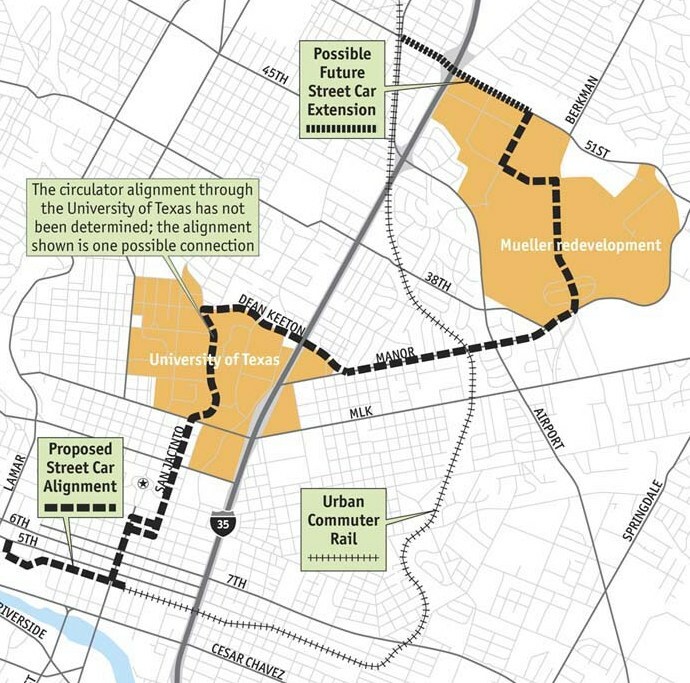 CATS map of potential rail corridors studied — but Guadalupe-Lamar was omitted! And subjective scoring system facilitated ratings that favored City’s desired route plan. Map: COA and URS. In what seemed like an Urban Rail Express to Mueller, by May 2012, the official urban rail proposal had gelled into a Phase 1 project running 5.5 miles from downtown, through UT’s East Campus via San Jacinto, then northeast via Red River St., 41st St., and Airport Blvd. into the Mueller site. The total investment cost was estimated to be $550 million. 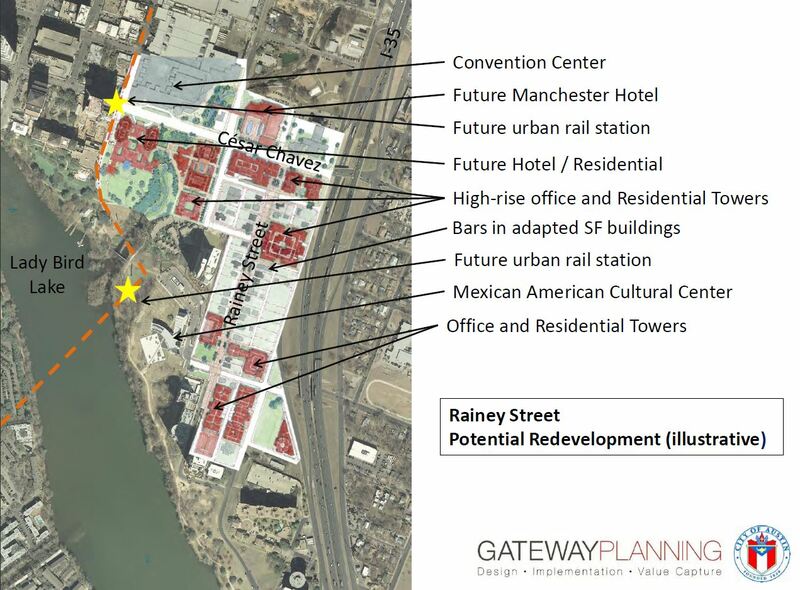 Finalized in May 2012, 5.5-mile, $550-million Phase 1 urban rail starter line was proposed to connect downtown, UT East Campus, Hancock Center, and Mueller site. Graphic: Project Connect. But the constant pounding by community critics — especially Lyndon Henry’s exposé of the outrageously dubious Route Alternatives Evaluation from 2010 — was taking its toll. The result was that Project Connect placed the Mueller Phase 1 plan on hold and shifted course dramatically. In early 2013, Kyle Keahey was hired as Urban Rail Lead to head a new “High-Capacity Transit Study”, tasked with supposedly re-evaluating everything, racing through a process (with a presumably more competent and defensible methodology) that would result in a recommendation by the end of 2013. You are currently browsing the archives for the Project Connect urban rail plan category.